What’s your lucky number? For Aerosmith, maybe it’s 3. Third album in as many years, Toys in the Attic is considered by some to be the album: “If you’re only going to get one,” the desert island record. Considering that Rocks was yet to come, let’s withhold judgement until we get there. For now just be aware there is a lot of Aero-love in the world for Toys in the Attic, and you can hear why. As if to prove that Aerosmith could keep up with some of their heavier competitors out there, “Toys in the Attic” is a blazing guitarfest careening through the speaker into your skull. What a way to open an album: it’s a statement. The band were honed to a razor-sharp edge by producer Jack Douglas. Joe Perry in particular had grown to be a ferociously good blues-rock player, and “Toys in the Attic” is the evidence. One of the great joys of listening to Aerosmith is finding the little known album gems that weren’t repeatedly re-released on hits packages. “Uncle Salty”, a slow crawl through the blues via the neck of a bottle, is one such track. Also underexposed is “Adam’s Apple”, which shows off Joe Perry’s greasy slide guitar sleaze. The horn section makes an appearance here too, adding extra sauce. Then they bring the funk on “Walk the Way”. Run DMC recognized that funk and knew how to update it in 1986. In 1975, Tom Hamilton’s rolling bass was the stuff that groove is made of. This is the kind of song that proves the musical ability of these five gents from beantown beyond the shadow of a doubt. Then the sassy horns return on “Big Ten Inch Record”, an old R&B classic from 1952. Remarkably the band pull it off with class and sassafras. “Sweet Emotion” is one of the band’s best known today, something that Tom Hamilton must be happy about, since it’s one of only a few Tyler/Hamilton co-writes. It’s no surprise that Hamilton had a hand in its composition since it’s based on another one of his rolling bass lines. But listen to the way Joey Kramer and Brad Whitford lock into him. That groove is the foundation on which Aerosmith was built. On top of that, Steven Tyler has always had a way with melody. “No More No More” is one of his most irresistible singalongs. The Sabbathy thunder of “Round and Round” was an unexpected twist. Tracks like this and the later “Nobody’s Fault” show the metallic side of Aerosmith that usually remains shrouded. “Round and Round”, though menacing and heavy as a brick, is the least memorable song on Toys in the Attic (only because the competition was so good). Brad Whitford takes care of the solos on this one, a song he co-wrote (just like “Nobody’s Fault”). So what’s better? Toys in the Attic, or Rocks? Let’s find out next time. Well put Mikey about Sweet Emotion! My first copy of this was on Cassette Tape and when I first heard Round And Round I was like…….Wowzers this is heavy! In a different way of course and what a slick move to put the ballads on at the end! Great move! But these Aeroballads back than were great pieces of work not just some thrown down fodder to end a record Nope Tyler hit one out of the park with You See Me Crying…..
Also liek you said Gems …like Uncle Salty/Adams Apple…classic …..
Uncle Salty might be my favourite from this record, nice to see it get a bit of time in the spotlight! GREAT pick Geoff. Love those underdogs. Gotta love hearing love for some deep tracks on these discs. Certainly, the “classics” have gotten worn out on classic Rock radio over the years. Never can forget, though the era was a bit before my time, the opening scene of “Dazed & Confused” movie was one of the best uses of music for “Sweet Emotion”. Never seen Dazed & Confused :) At least all the way through. That’s McConnahey right? I bought it and returned it after watching about 30 minutes. Easy question at the end – Rocks, every time! NOT so easy…my little yellow friend! Sweet Emotion… that song must be in the top 5 of best rockers ever. Another Ratt anecdote? Guess why the wrote a song called Round And Round…? Hah no way. Ratt must really have been Aerosmith fans! Yep. Read an interview with Stephen Pearcy and he spilled the beans on Round And Round and Walkin’ The Dog. Well how bout that. Doesn’t surprise me, but they really didn’t sound like they had a lot of Aerosmith influence on the surface of it. My first Aerosmith album. My uncle gave it to me on LP when I was an elementary school student. I played it so much that I wore out the vinyl! That’s great! I hope you own a CD copy today! I think Rocks vs. Toys is splitting hairs really. They’re both flawless so it depends on my mood which one I’ll go for. Cool review Mike. Can’t add much when the albums are this good! Agreed. That’s one reason why I don’t enjoy reviewing “big” albums. What can I add? But thanks for the comment and hanging on for the ride! Yeah it is daunting. When you do a classic album you have to block out the noise, and just go with what you know. But I also feel that a classic album deserves a little more detail than, say, my next Dokken review. AWESOME album by the way. Top 30 of all time in my books. I love the lesser knows, Uncle Salty, You See Me Cryin, Big Ten Inch Record, etc. I was introduced to this back in the early 80’s by my fave Uncle and Aunt. I spent the summer with them listening to 70’s rock. He was the guy that told me to go see The White(Michael White’s band), and his favourite band was Led Zep. For those who don’t know, Michael White is legendary in these parts. And incredible musician. He used to helm the premier Zep tribute band, The White. Thanks man, glad to know you love this one too. It might soon be time for an album review of Michael White S/T. I’ll have to pull out my copy and give it a spin. Maybe a back to back with Kingdome Come S/T. As far as I know, Michael White and The White are still at it. I think they are Q107’s House Band as well. I saw them roughly 5 years ago for the umpteenth time doing Led Zeppelin II. They still sounded great. Ooooo this makes me regret not hearing any of the deep cut stuff. I only know the hits. AWESOME! Aero’s deep cuts are as good as the hits — for sure. This was the second Aerosmith album I picked up (couldn’t not after hearing Sweet Emotion, Uncle Salty and Walk this Way. I remember looking straight at the stereo after hearing the opening salvo and thinking “how very dare they!” – what a way to open an album. Outstanding stuff. Anyway, really great review, Mike – nailed it. Opening salvo, it’s got it all this album! I would agree this IS their best album, definitely my favorite. 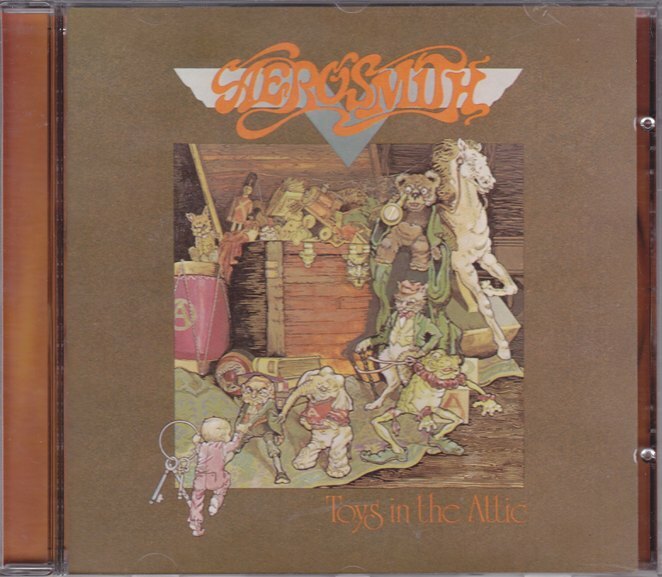 Toys in the Attic was the first Aerosmith album I listened to and continues to be my favourite after all these years.